LightSwitch launch on the Sydney foreshore – awesome show! Microsoft Visual Studio LightSwitch launch in Sydney saw a cool light show happen on the Sydney foreshore. Throughout October and November cities around Australia will host the Switched On LightSwitch and Azure events. The 1-day events are split into three sessions and you can choose to attend either individually or all three. Excellent timing i say with LightSwitch having been released not that long ago. Take a look at the agenda on Andrew Coates’ blog where you’ll also find the registration links. I’ll definitely be there for the Perth event on November 2nd. I was browsing around for for a quick and dirty SharePoint 2010 warmup script for Powershell the other day, and found quite a few – however, all would fail for me. See, the environment i’m running is a FBA (or rather AD + ADFS, multiple domains, no trust) environment and the scripts i found would all throw a 403 Forbidden error. Figured quickly that this was of course caused by the WebClient call that most scripts utilised, so to overcome this obstacle i changed the WebClient call out with a WebRequest call and added the all-important UserAgent (this is the reason you’d get the 403 Forbidden error btw). So, quick and dirty solution…still some stuff to do on it, such as ensure that the timeout error can be handled – but that’s for another day. I also added a “start-sleep 1” as SharePoint 2010 would go crazy if i just let it run without it (too many SP objects). Disclaimer – this code is provided “AS IS”..should be no danger in running it, however, clean it up as it’s a subset of my own code here (doing other things too) and is a cut n’ paste n’ edit. I probably look forward to this time of year more than any other. 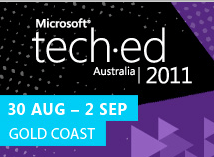 It’s time for Microsoft Tech.Ed Australia 2011 (30th of August – 2nd of September) and this year we’re really going to celebrate being a Geek. If nothing else, i’m a Geek (with a capital G that is)…No, not the circus freak type (ok, that’s debatable i agree). Yes, i’m socially boring and unattractive. tick! Yes, i’m preoccupied with computing. tick! Yes, i’m a degenerate. tick! So, back to Tech.Ed – this year we’re celebrating Geeks and the Chief Geek is hosting the keynote – that’s right, Adam Spencer (co-host of ABC’s Sleek Geeks) is hosting the keynote! Sweet! And it’s not stopping there either! Jarod Green (yes, THAT Jarod Green, creator of Beached Az) is going to be at the keynote too! Boy did i have fun – last night we had a location meeting at work and I was presenting the Technology Update from the FMSC. Since one of the technologies that’s just been released was the Windows Kinect SDK it was suitable to demo the Kinect in front of the audience. With Fujitsu’s 76th Anniversary happening on the same day, the theme was Japanese, and I couldn’t forego the opportunity to have a bit of a laugh – so the result was a Microsoft Kinect demo whilst wearing a sumo suit. Needless to say it was hot in that suit and with nearly 120 people in attendance it didn’t get any cooler as the night wore on – so afterwards it was time for a beer.